Former President Jimmy Carter needs to borrow a line from Monty Python and the Holy Grail … I’m Not Dead Yet!!! It would appear that Donald Trump was a bit premature in announcing the death of “the late, great Jimmy Carter (VIDEO).” Yesterday at CPAC, The Donald compared the Obama presidency to that of the disastrous, failed presidency of Jimmy Carter. Trump stated that Obama’s job approval numbers at 38% were now in Jimmy Carter territory and that he never thought he would see another presidency like the late, great Jimmy Carter. Oops. Make no mistake, Jimmy Carter, 39th President of the United States has not passed away. However, Carter’s presidency was. With Barack Obama’s failed foreign and domestic policies and adverse impact on America, it would look like from his falling polling number, Obama’s presidency is dead as well. VP Joe Biden Tells Democrats, Be Optimistic on State of the Nation ‘In Spite of Who’s President’ … “The American People Are With Us”… Really, The American People Are Against Obama! HE SAID WHAT? … Did Vice President Joe Biden just diss Barack Obama and then say Americans Agree with Democrats? Joe Biden told fellow Democrats at the House Democratic Caucus Issues Conference in Cambridge, MD that they should be optimistic about the state of the nation, “in spite of who’s president.” Hmm, kind of an interesting word choice when the current president is Barack Obama, a Democrat. This was Biden’s best effort to rally the beleaguered Democrat troops who face a tough uphill climb in the upcoming 2014 midterm elections thanks to the policies, agenda and signature piece of legislation from who is president. Isn’t it interesting that Biden would reference the MSM viewing the Democrats prospects first and then calling “We the People,” the Americans who are adversely affected by Barack Obama’s and Democrat’s policies as … “everyone else”. Not like we do not know that the liberal MSM is in the tank for Obama and has been since the beginning. The media has been AWOL on vetting Obama, holding his feet to the fire, questioning his failed economic and domestic policies and investigating the all too-numerous scandals like IRS-gate, Benghazi-gate, “Fast & Furious” and NSA-gate. It would appear that Biden and Obama believe that the MSM will continue to be their own personal Gunga Din heading into the 2014 midterms. 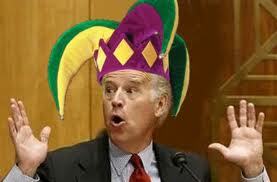 But it does not stop there when it came to Biden’s head in the sand comments. Anvil Joe made the preposterous comment to Democrats that, “The American people are where we are.” Really, in what sense, in the United States? The American people are in no way any where near where Barack Obama, Nancy Pelosi, Harry Reid and their lock-step, rubber stamp Democrats have lead this country. In fact, they more the American people learn the truth of the lies that have been told to them and adversely affected by Democrat foreign and domestic policy, the more they are not with Democrats. A question to Joe Biden, exactly what are the people with you on? The fact of the matter is that the American people are not with Democrats and it is scaring them silly that they may lose even more House seats in 2014 and talk of losing the Senate to the GOP is a real possibility. Vulnerable Democrat candidates are running from Obama, his agenda and their vote. Obama is also acting as Emperor in arbitrarily extending Obamacare deadlines so to protect Democrat politicians, not to help the American people or America. THE FACTS … The American People Are NOT with Democrats. V: The American people, including Democrats, are overwhelmingly opposed to how Obama is conducting executive orders and circumventing Congress is how government is supposed to work. VI. The American people are against Obama going around Congress, except if you are a Democrat or Black, and of course if it were a GOP president. VII: Barack Obama and Democrats rail about income inequality and the income gap, yet every single demographic in America believes that it has increased under Obama. As if President Barack Obama has not done enough damage to the economy and the country, Obama is now doubling down and going try and finish the job of destroying America. Obama claims that 2014 is going to be a year of action and during his Weekly Address that he will move forward and act alone without Congress on certain issues if he can’t gain the legislative body’s cooperation. His exact words were, “I want to work with Congress on proven ways to create jobs.” Work with Congress, since when? Proven ways, like what … increasing the minimum wage, Obamacare, extending unemployment, amnesty for illegals and raising taxes? All are proven ways to reduce jobs and create a further government dependent class. This rhetoric is coming off his earlier comments this week, that he has a pen. This is not leadership, it’s authoritarianism and Unconstitutional. This lying clown has been promising jobs for 5+ years and all his policies have provided us is extended long term unemployment, record number of Americans on food stamps and record low job participation rates. So the Sith Lord says he is going to act alone and act without Congress. Take a good look at what Obama considers his signature piece of legislation. Obamacare was passed with no GOP support and he had to beg and make sweetheart deals like the Corn Husker kickback and the Louisiana Purchase to bribe Democrats into supporting it for passage. Just curious, how is Obamacare working out for America? Do you honestly want this man f’ing up immigration and the rest of the economy? However, it is not the GOP that Obama needs to worry about in 2014, it is his own Democrat party. With Barack Obama’s job approval ratings barely in the 40′s and with Obamacare a continuing nightmare for Americans, Obama is not a wounded lame duck president, he is a toxic one. What Democrat is going to want to sign on to any unpopular Obama idea and if Obama plays the “executive order” card to bypass Congress, he will further destroy the Democrats in the 2014 midterms. 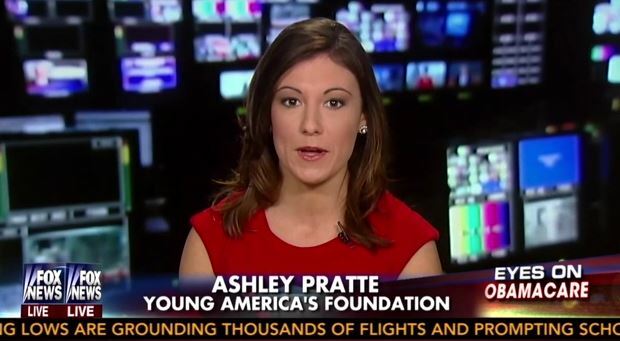 Add another accomplishment to Barack Obama … Hardly ‘Hope and Change’ for the Youth. 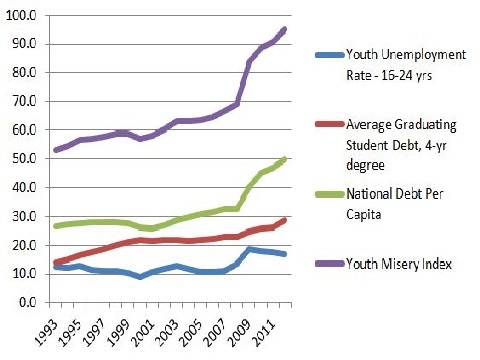 The Youth Misery Index hits all-time high under Barack Obama. In 2009 when Obama took office, the YMI was at m 83.5; however, has skyrocketed to 98.6 in 2013. This represents an 18.1% increase since Obama took office. But Obama claims he is for the youth of America and the youth continue foolishly vote for him in large numbers. The index is calculated by adding youth unemployment and average college loan debt figures with each person’s share of the national debt. And before Obama and his minions blame Bush, when President George Bush left office in 2008, the index was 69.3. A Youth Misery Index that measures young Americans’ woes has skyrocketed under President Barack Obama and hit an all-time high. The index, released Wednesday, was calculated by adding youth unemployment and average college loan debt figures with each person’s share of the national debt. While it has steadily grown over the decades, under Obama the figure has shot up dramatically, from 83.5 in 2009 to 98.6 in 2013. The index has increased by 18.1 percent since Obama took office, the highest increase under any president, making Obama the worst president for youth economic opportunity, according to the nonprofit that released the figure. Youth unemployment in 2013 was 16.3 percent, and student loan debt came in at a record-breaking average of $29,400 last year, the foundation points out; what’s more, each person’s share of the roughly $17 trillion dollar national debt stands at its highest level ever: $52,948. Sorry, but what Obama has done to the youth of America should be considered a crime … Can he be charged with child abuse? How about Generational theft? UPDATE I: Thanks Teach for the link at the Pirate’s Cove. This should come as a shock to absolutely no one … According to Forbes ranking, Detroit, Michigan tops the list as the most miserable city in the United States. Detroit was a pretty easy choice for #1 with its violent crimes, high unemployment, dwindling population and financial crisis. What do you notice that every one of these cities has in common … Democrat leadership, or the lack thereof. What do these cities also have in common, they all overwhelmingly voted for Barack Obama. Don’t look now, as the immortal Casey Kasem would say during his music countdown, Obama’s current home town of Chicago is #4 with a bullet. The latest blow was Tuesday’s announcement that the city is on the verge of being taken over by the state. Detroit is in a financial emergency and cannot pay its bills. The city has been issuing debt to fund day-to-day operations. The continuing problems propelled Detroit to the top spot in our 2013 ranking of America’s Most Miserable Cities. This year we examined nine factors for the 200 largest metro areas in the U.S. The metrics include the serious: violent crime, unemployment, foreclosures, taxes (income and property) and home prices. We also include less weighty, but still important quality-of-life issues like commute times and weather. Detroit’s problems are hardly new. It has been in a four-decade decline, paralleling the slide of the U.S. auto industry. The city’s debt rating was cut to junk by Moody’s Investors Service in 1992, but declining tax revenues from a shrinking city will soon make Detroit a ward of the state. Violent crime in the Detroit metro division was down 5% in 2011, but it remains the highest in the country with 1,052 violent crimes per 100,000 people, according to the FBI. The city’s financial problems have forced significant cutbacks to the police force. It is a circuitous problem as high crime and unemployment force people to leave the city, which lowers the tax base and strains Detroit’s finances further. TOP 10 List. The rest of the Top 20 can be seen HERE. 4. Chicago, IL – With Barack Obama in office and Rahm Emanuel as mayor Chicago is fading fast. Emanuel’s approval rating plummeting and Chicago is becoming the poster city for gun violence, even with the strictest gun laws in the country. Chicago has slipped from 10th in 2010, 7th in 2011 and 6th in 2012. With the strictest gun laws in the country and with it is only a matter of time before Chicago becomes #1.